Issue 7 of Photochemical & Photochemical Sciences is a themed issue on ‘Blue-light photoreceptors’ and is now available to read online. The front cover this month features work by Aba Losi and co-workers from Parma, Italy. Their article takes as its starting point the increasing evidence that prokaryotic organisms can sense and react to light stimuli via a variety of photosensory receptors and signal transduction pathways. The authors present a comprehensive scenario of the existence of bilin-GAF, LOV and BLUF proteins in the prokaryotic world, and inspect possible phylogenetic pathways. They also define novel criteria for identifying gene (and protein) sequences based on experimentally assessed photochemical events. The latest issue of PPS is now available to read online! This month’s issue is a themed issue of contributions from the 7th European Meeting on Solar Chemistry & Photocatalysis: Environmental Applications (SPEA 7), held in Porto from 17th to 20th June 2012. Read the Editorial by Guest Editors Joaquim Faria and Sixto Malato here. The front cover highlights work by Roland Marschall and co-workers from Ruhr-University Bochum, Germany. They developed barium tantalate composites which showed enhanced photocatalytic hydrogen generation. After preparing (111)-layered Ba5Ta4O15photocatalysts via a solid-state reaction route and a citrate synthesis route, X-ray powder diffraction and absorption spectroscopy determined the presence of a second phase – Ba3Ta5O15. The Ba5Ta4O15/Ba3Ta5O15 composites demonstrated up to 160% higher hydrogen evolution rates than for pure Ba5Ta4O15. In addition, only very small amounts of Rh co-catalyst (0.025%) were needed to achieve these results. Read the full article for free for 6 weeks! 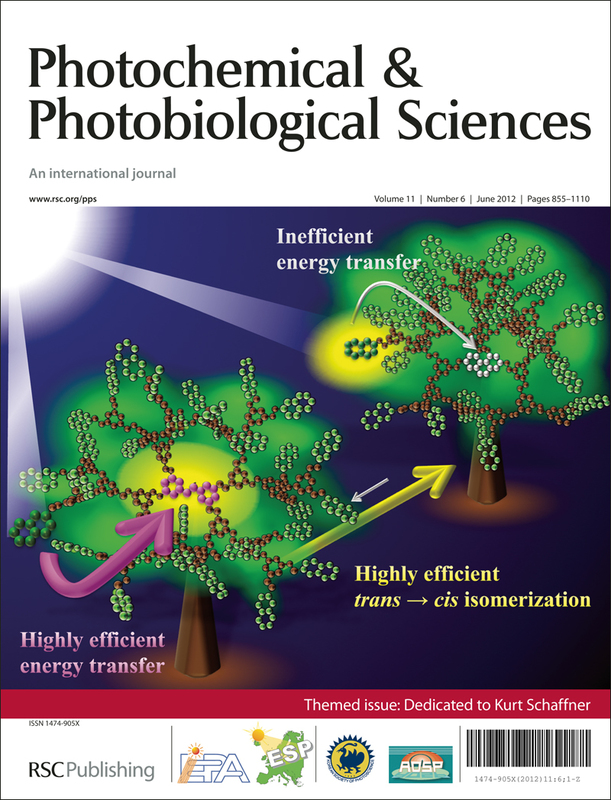 Stay up-to-date with the latest developments from Photochemical & Photobiological Sciences by signing up for free table of contents alerts. PPS issue 6 is now online and is a themed issue in honour of Kurt Schaffner on the occasion of his 80th birthday. You can read the introduction to this issue by Editors Silvia E. Braslavsky, Santi Nonell and Frans De Schryver here. Read the full themed issue online here. The front cover features work form Tatsuo Arai and co-workers from the Graduate School of Pure and Applied Sciences, University of Tsukuba, Japan. Their paper investigates photoisomerization and energy transfer in naphthalene-terminated stilbene dentrimers. 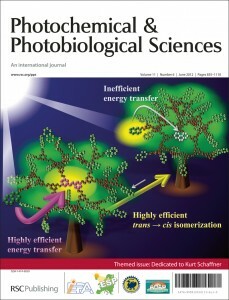 They demonstrate photoisomerazion via highly efficient energy transfer from the dendron group to the core stilbene and that intramolecular energy transfer efficiency was controlled by trans-cis photoisomerization. Interested in knowing more? Read the full article for free for 6 weeks! You can keep up to date with the latest developments from PPS by signing up for free table of contents alerts. 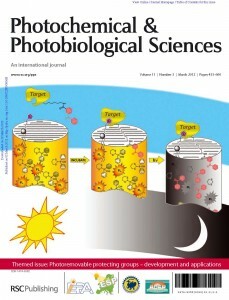 Themed issue on photoremovable protecting groups is now online! PPS Issue 3 is now online and is a themed issue on photoremovable protecting groups: development and applications, see the full issue here. This themed issue presents research papers and perspectives on applications of photoremovable protecting groups that provide spatial and temporal control over the release of various chemicals and bioagents. Read Guest Editor Jacob Wirz’s Editorial which introduces the topic here. The front cover represents an article by Andrei G. Kutateladze and co-workers from the University of Denver in the USA. In their study externally sensitized fragmentation in dithiane PPG-protected carbonyls is adopted for detection and amplification of binding events, which trigger massive self-amplified release of benzophenone from its masked state, simultaneously quenching the fluorescence. Read the full article for free here until 12th April! Welcome to the first issue of 2012 a themed issue on the biology of UVA! This issue dedicated to UVA contains several in-depth perspectives and original articles in the field highlighting key advances and provides an interesting and comprehensive journey through the UVA field, even those for whom this particular area is less familiar. You can read an introduction to this issue in Evelyn Sage and Rex Tyrrell’s editorial. This issue is not only a themed issue, it also contains the 2011 progress report (an update on the full quadrennial report published in 2011 issue 2) from the United Nations Environment Programme, Environmental Effects Assessment Panel on the environmental effects of ozone depletion and its interactions with climate change. Read 2012 Issue 1 online here! PPS Issue 9 Online Now! PPS Issue 9 is a themed issue in honour of the contribution of Japanese scientists to photochemistry, read Guest Editors’ Cornelia Bohne (University of Victoria, Canada) and Tadashi Mori (Osaka University, Japan) Editorial here. The front cover features a selection of images from the articles included in this themed issue. In a recently published perspective on the use of sunbeds Jean-François Doré and Marie-Christine Chignol discuss prevalence of their use and examine the evidence suggesting that use of indoor tanning increases the risk of skin Cancer. The authors conclude that the use of sunbeds should be strongly discouraged and banned under the age of 18. To find out more, read the full article for free until September 16th! This article is part of an upcoming Themed Issue on UVA radiation with Guest Editors Rex Tyrell (Bath, UK), Vivienne Reeve (Sndney, Australia) and Evelyne Sage (Orsay, France). 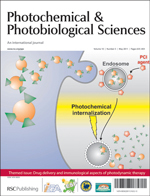 Issue 5 of Photochemical and Photobiological Sciences has now been published online and is a themed issue on Drug delivery technologies and immunological aspects of photodynamic therapy. The guest editors Kristian Berg (Oslo University Hospital), Jakub Golab (Medical University of Warsaw), Mladen Korbelik (British Columbia Cancer Agency) and David Russell (University of East Anglia), introduce the topic in their editorial which you can read here. The cover features an article from Gang Zheng and co-workers in Canada and China entitled ‘Cytosolic delivery of LDL nanoparticle cargo using photochemical internalization’. In this study endolysosmal disruption using PCI was attempted on surface-loaded, protein-loaded and core-loaded cargo incorporated into LDL nanoparticles. You can read the full article here.